The Revolutionary Government of the Republic of Cuba strongly rejects the parliamentary and judicial coup d’état perpetrated against President Dilma Rousseff. The Government’s estrangement from the President, without presenting any evidence of corruption or crimes of responsibility against her, as well as from the Workers’ Party (PT) and other left-wing allied political forces, is an act of defiance against the sovereign will of the people who voted for her. The governments headed by Luiz Inácio Lula da Silva and Dilma Rousseff implemented a socio-economic model that made it possible for Brazil to take a step forward in areas such as production growth with social inclusion, the creation of jobs, the fight against poverty, the eradication of extreme poverty among more than 35 million Brazilians who used to live in inhumane conditions and income increase for another 40 million; the expansion of opportunities in the areas of education and health for the people, including those sectors who had been previously marginalized. During this period, Brazil has been an active promoter of Latin American and Caribbean integration. 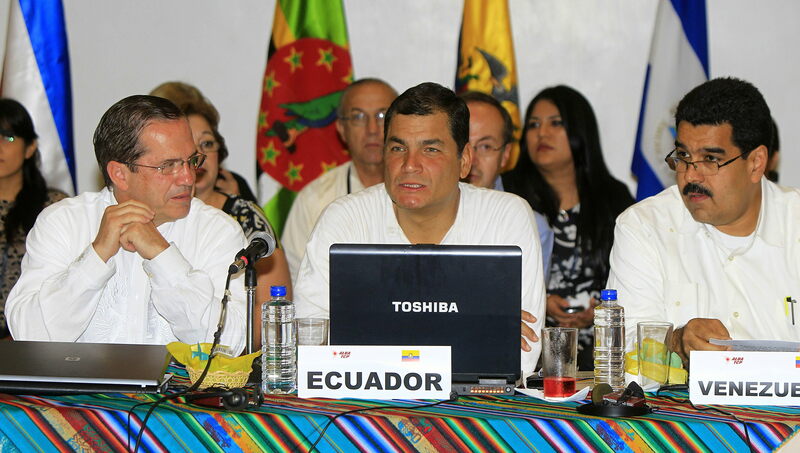 The defeat of the Free Trade Agreement of the Americas (FTAA), the celebration of the Latin American and Caribbean Summit on Integration and Development (CALC) which led to the creation of CELAC and foundation of UNASUR are transcendental events in the recent history of the region which show the leading role played by that country. Likewise, Brazil’s approach to the Third World nations, particularly Africa; its active membership in the BRICS Group (made up by Brazil, Russia, India, China and South Africa); and its performance at the United Nations Organization, the Food and Agriculture Organization of the United Nations (FAO); and the World Trade Organization, among others, are an acknowledgement of its international leadership. Equally praiseworthy has been Brazil’s performance under the Workers’ Party governments in crucial international issues for the defense of peace, development, the environment and the programs against hunger. The efforts made by Lula and Dilma to reform the political system and organize the funding of parties and their campaigns as well as in support of the investigations started against corruption and the independence of the institutions responsible for such investigations are too well known. The forces that are currently exercising power have announced the privatization of deep water oil reserves and social programs curtailments. Likewise, they are proclaiming a foreign policy focused on the relations with the big international centers of power. Quite a few among those who are impeaching the President are currently under investigation for acts of corruption. What happened in Brazil is another expression of the offensive of imperialism and the oligarchy against the revolutionary and progressive governments of Latin America and the Caribbean which threatens peace and stability of nations and is contrary to the spirit and the letter of the Proclamation of Latin America and the Caribbean as a Zone of Peace, signed at the Second CELAC Summit in January, 2014, in Havana by the Heads of State and Government of the region. Cuba reiterates its solidarity with President Dilma and comrade Lula as well as with the Worker’s Party, and is confident that the Brazilian people will defend the social achievements that have been attained and will resolutely oppose the neoliberal policies that others may try to impose on them and the plundering of its natural resources.